Per Ian Rapaport, CJ Spiller, MJ and Hall all playing today. Pleasantly surprised MJ will find his way onto the field today, though that probably means Hunt will be deactivated again. I liked what I saw from him last week and wish he could get a few more reps when opportunities present themselves. Ghee, Burkhead, Lewis-Harris, Pollak, Hawkinson, Whalen, Hunt. Stevie Johnson a scratch for the Bills. Both Gilmore and Byrd playing tho. So...do I watch Green Bay annihilate Baltimore or the Jets bomb Pittsburgh back into the Stone Age? OK - just outside Browns locker room. Some players singing "Let's Get Physical" by Olivia Newton-John walking out to field. #What? 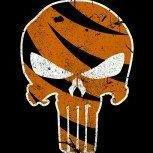 Come on Who Dey let's get a win today. Disappointing stall on a promising drive. Two poor throws. What's up with that kick? Absolute bullcrap if that's a late hit. Well, defense played like complete f**king s**t there.